*The Dinner Show Package includes (per person) a VIP premium reserved seat, a house salad, 1 item from the Improv menu, along with tax and gratuity. Originally working as a firefighter in Mississippi, Miller moved to Atlanta in 2005 and began a career in comedy. His first television appearance was on Robert Townsends: Partners in Crime - The New Generation. He has since appeared in multiple televisions shows such as Hell Date ,Yo Momma, Bill Bellamy's Who's Got Jokes, The Mo'nique Show, Off the Chain, Comic View, Last Comic Standing and Wild 'N OutMiller has also been featured in written publications for MTV, EarHustle411, Oxford Citizen along with V-103's Frank and Wanda morning television/radio show and Atlanta’s HOT 107.9.Currently based out of Atlanta, Karlous has performed in London,Germany, St.Thomas,Virgin Islands, and Puerto Rico, and various colleges throughout the United States. Miller also states this his comedic influences consist of Redd Foxx, Bernie Mac, Mo'Nique, Richard Pryor, Eddie Murphy, Cedric the Entertainer and Steve Harvey.In addition to comedy, Miller is said to have a passion for music. He has also worked along musicians such as Case, Gucci Mane, Dem Franchize Boyz, Granddaddy Souf, Big Oomp, Jermaine Dupri and T.I..Ultimately, Miller is known for his role in Wild 'N Out and his notorious "wildstyle" battles with fellow alum Chico Bean. Partaking in a series of improvisational musical and comedic games Miller is praised for his comedic genius and witty punchlines.An American rapper, actor, comedian, singer, and internet personality, DC Young Fly is well known for his Vine videos and appearance's on MTV's Wild 'n Out. 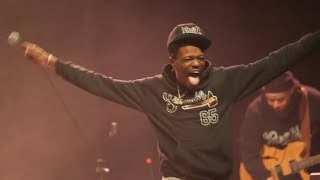 DC Young Fly was born as John Whitfield on May 2, 1992, in Atlanta, Georgia, United States. DC Young Fly grew up in the Adamsville neighborhood, on the west side of town. He attended Benjamin E. Mays High School.Age 24, DC Young Fly holds an American nationality and belongs to black ethnicity. Moving to his personal life DC Young Fly is in a romantic love life relationship with his girlfriend Jacky Oh. DC Young's girlfriend Jacky Oh is a model.The couple has a daughter together, Nova Whitfield who was born in 2016. After losing a close friend in 2011, DC Young Fly began pursuing a rapping career and getting a D.C. (Da Crew) tattoo on his forehead in his Best friend's memory. DC Young made his film debut as "Eric" in David E. Talbert's film "Almost Christmas".